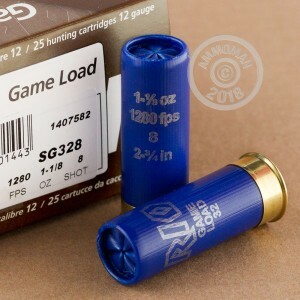 This 12 gauge upland game ammunition from Rio Royal is an inexpensive, effective choice that can also double as a clay shooting load. 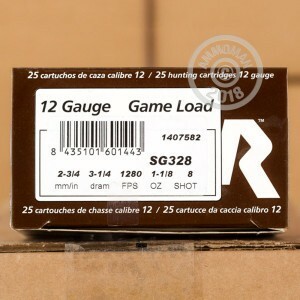 Each shell in this box of 25 fires a 1-1/8 ounce load of #8 birdshot at a muzzle velocity of 1,280 feet per second. This makes it a relatively powerful load with decent reach and good patterning. Rio Royal shells are loaded in both the USA (at a facility in Marshall, Texas) and Spain. All purchases over $99 at AmmoMan.com come with free shipping!